The Tesla stock price is down nearly 2% this morning as the market digests yesterday's Tesla Motors Inc. (Nasdaq: TSLA) shareholder meeting in Mountain View, Calif. The biggest news from the fifth-annual TSLA shareholder meeting was the announcement that company CFO Deepak Ahuja will be retiring in 2015. He's been with the company since 2008. Musk described the departure as "akin to letting go of a child," before describing Ahuja's importance to the company. Musk also announced that Tesla will begin delivering Model X SUVs within the next three or four months. That means the vehicle won't be available until late in the third quarter. Tesla maintained a delivery goal of 55,000 for 2015, and the Model X will play a big part in reaching that target. More than 20,000 Model X SUVs have already been ordered. Musk also touted the safety features of the electric SUV. While many SUVs have a tendency to roll over, the Model X's heavy battery pack underneath the car limit that risk. Musk even said the Model X could be the safest SUV in history. Another factor moving the Tesla stock price today is an update on the company's autopilot technology. By the end of June, Musk expects to have a "beta" version of the company's new Model S with auto-driving capabilities available to select customers. The vehicle will be "predominantly autonomous" on the highway. Within the next several years, Tesla expects to sell vehicles that will allow drivers to "fall asleep in your car and wake up at your destination." Finally, the company also updated shareholders on the company's venture into home batteries. Tesla plans to increase the storage capabilities on its Powerwall home battery system from 3.3 kilowatts to 7 kilowatts. 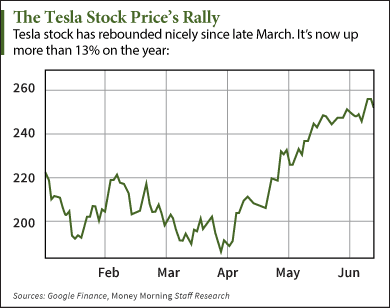 Despite those encouraging updates, the Tesla stock price still dipped to $248.50 shortly after the opening bell. TSLA stock is now up 24% since the end of March and 12.6% year to date.